Despite being in an unfamiliar setting, Braintree looked right at home. Wamps’ sophomore right-hander Kyle Roche fired 2.2 innings of scoreless relief following 4.1 innings of shutout baseball from John Tellier as Braintree defeated Silver Lake, 2-0, in the first round of the Division 1 South Tournament on Thursday afternoon at Silver Lake Regional High School. Braintree (12-9) advances to play Brookline in the Div. 1 South Quarterfinals on Monday afternoon. In the bottom of the seventh trailing by two, the Lakers threatened. Facing Roche, Silver Lake drew a pair of walks to put the tying run on base with one out. Alex Bejarano followed with a line single to right that looked to load the bases. Lakers’ Alex Heffernan, however, took a wide turn around third base and Wamps' first baseman Cole Flannery threw behind him for the second out of the inning. Roche then slammed the door inducing a groundout to second base to give the Wamps the opening round win. Braintree, who entered the postseason at 11-9, looked refreshed and rejuvenated regardless of missing the Super Eight tournament for the first time in its five year history. After the Wamps left six men on through the first three innings, they broke the ice in the fourth. With two outs, Marco Carnes singled to left and Jackson Duffy lofted a double to right. On 2-1, Jack Collins slashed a line drive to third that got under the glove of Dan Collins and rolled into left to give the Wamps a 1-0 lead. Moments later, Kennedy lined an RBI single through the right side to put Braintree on top, 2-0. Tellier, meanwhile, began his outing with three no-hit innings but ran into trouble in the fourth. Jake Armstrong led off the inning with a double and consecutive walks loaded the bases with nobody out. The Wamps’ ace regained his composure on the mound, striking out Dan Collins with a high fastball before generating a weak ground out to Kennedy for a force at home. Tellier then closed out his final full inning by getting a fly ball to left to evade unscathed. Lakers’ starter Michael Quigley (CG, 7 H, 0 ER, 6 Ks) kept his team within striking distance throughout the afternoon. 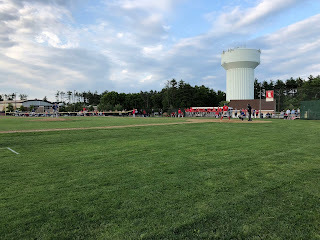 The sophomore right-hander stranded two in the first and sixth, and the bases loaded in the second to prevent the Wamps from blowing the game open. After letting two to reach base in the fifth, Tellier was lifted for Roche. The sophomore showed no signs of trepidation despite pitching in his first tournamnet game setting down the first five batters he faced to send the game into the seventh with Braintree still nursing a 2-0 lead. "Defensively we were making plays so I just tried to pound the zone," said Roche. "I knew if they put the ball in play, we'd make the play." The Wamps now turn to a rematch with Brookline from earlier this season - a 10-7, 10 inning win for Brookline back on May 17th. “The first game of the tournament is always the toughest one especially coming down here to Silver Lake – great tradition, great program. Now we’re onto the next one,” said O’Connell.